The AI-powered Google Assistant voice search, has now added a groundbreaking feature that changes the world in internet search which adds beauty to our cutting-edge technology: Google Lens – Search what you see! Before we begin, let’s keep your moods up and watch this funny promotional video done by Nokia to promote Google Lens. Google Lens is a camera viewfinder to identify objects which you don’t recognise, yet curious to find out, whereby it works exactly like a QR code scanning. You just need to point the Google Lens app camera from the Google Assistant mobile app onto an external object or words, and once the image is scanned, it will be generated into contextual information just by clicking on the coloured dot on the image, which changes the way everybody uses mobile search. For instance, if you want to search for things you saw for the first time that you are interested in, such as rare plants or animals, foreign textual images, street signs, buildings, wifi networks, restaurants, barcodes, items, gadgets and even artworks, and offering so much more which outsmarts our most trending Google Assistant voice search! 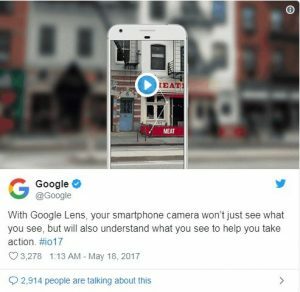 Google’s AI came with the grand announcement of the Google Lens official launch in May 2017 at Google I/O. In year 2018, this powerful tool has been integrated into Google Assistant and Google Photos. 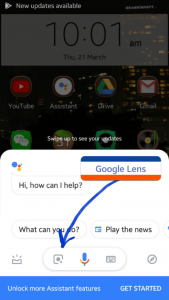 In November 2018, Google has announced that Lens will be included in the Google Image Search. To top off the WOW factors, Lens has also been incorporated into Google Photos, Google Maps and also Google Translate. Previously, Lens is available in iOS, but now the app is compatible for download in Samsung series such as Galaxy S8/S8+, Galaxy S9/S9+, Galaxy Note 8, along with other smartphone brands like Huawei, Xiaomi, Asus, LG, Nokia and Sony. Rather than typing on the search engine to do research, Lens has proven itself as viable direction for all of us to evolve, providing a promising perspective and faster solution for both consumers and marketers to learn and navigate around with ease of access. Another good news is that, on the 22 March 2019, Xiaomi’s latest models have integrated Google Lens into the default camera app. All you need to do is to activate the Google Lens at the phone settings. This feature also works on Redmi Note 7, Redmi Y2 and Poco F1. 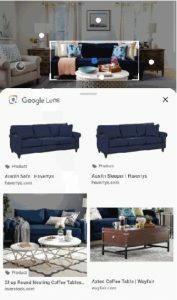 Google Lens is a multipurpose companion in helping customers find information seamlessly on something they are keen to purchase, such as a sofa model in your friend’s house that you don’t know. 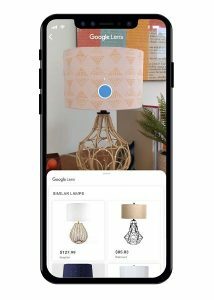 Once you focus your Google Lens camera on the chair, you will be given the model name and which store outlets to purchase from. Once you come to know where to buy it, it makes the consumer research much easier, and makes it even more convenient for them to CTA (call to action). Moreover, Google Lens has an added feature to search for related images to the image that is being scanned by your phone, which makes the image search so simple with a good user interface. This will make it easier for customers to purchase goods in bulks rather than just one or two items from the image search in Lens. 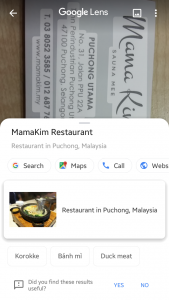 As Google Lens also can scan QR codes, consumers don’t need a QR code scanner app, or even to launch any other apps that involve steps to open QR code scanner such as WeChat or Line. 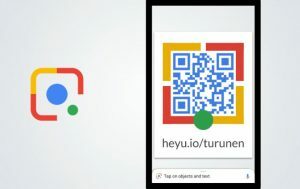 Instead, users can use Google Lens to detect the QR code image, and all the information that users want will be generated, or it will straight off land the users into the website itself. 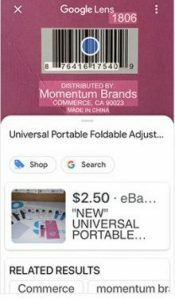 Since Google Lens can scan for QR codes, it can also scan for barcodes if the item that users are interested to buy doesn’t provide clear pricing info, or when the items in supermarket has the wrong price tag on the shelf for a different item or brand. This saves people from asking the supermarket employees of the pricing or running from corners to corners in supermarket just to find a barcode scanner. Plus, Google Lens Translate enables users to make firm purchasing decisions on foreign items with foreign descriptions. Moreover, Lens becomes extremely useful when people enter into a foreign country, and that is when the foreigners don’t understand the language on street sign, discovering the details contained in each points of interest, trying to book a hotel and understanding foreign description on the food menu in a restaurant, Lens becomes their very lifesaver by being able to translate into 13 different languages. Many a times, shoppers who became interested with a product with foreign description end up in shopping cart abandonment due to lack of understanding of the product and language barrier. 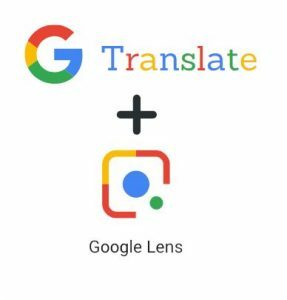 Therefore, Google Lens having the Google Translate feature, uplifts the problem of purchasing decisions in this aspects by decoding and offering translation to the preferred language after scanning the product image description using Lens. 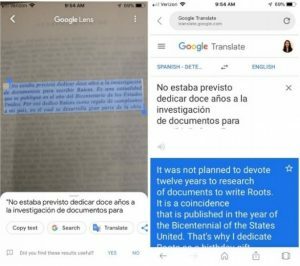 Not just so, as some people want to read up some contents like case studies during work hours, or read online novels and wanting to know the meaning behind movie subtitles, Google Lens alleviates language barrier issues among smartphone users and users are able to read any contents of any languages effortlessly. Also, when you come across an ad outside a marketing outlet such as restaurants, and you want to know more about the shop. From there, you can even scan the image while sitting in your car passing by the shop, and the image will generate the upcoming offers and the opening hours. Not only so, sometimes if the CTA is labelled on the printed ads, it turns offline to online experience by copy-pasting the CTA text info into their phones which helps you make calls or write emails, or even find the shop location in Google Maps. Through this, marketers who are selling the products searched by the customers can gain the ROI benefit even faster than before Google Lens is launched. Not only so, the information generated from the image will lead to a higher lead generation in sales traffic. Plus, this consequently increases the CTR (click through rate) and also the conversion rate of the website being automatically accessed by Lens. Once the CTR increases, it will spontaneously gives a good SEO (search engine optimisation) ranking of the particular website in which Google Lens accessed for the ones image-researching the product. Not only it quickens the CTA in this manner, but because the Google Lens can detect any image display, if there is an URL link displayed on an external ad, once you open the Google Lens extension in Google Assistant, the URL display will generate into an URL link that will straightaway bring users to a landing page for users to conduct purchasing decisions or subscribe to a newsletter, which is even more convenient that typing on the mobile keyboard to gain entry to landing page. Not only so, the results will load even faster than typing on keyboard. Even for business cards that you see on your desktop while looking for jobs, all you need is to scan the image from your phone, and the image will auto-generate it into text forms for you to copy-paste the contact info of a company, and you’re good to go! In relation to the language barrier faced by customers as mentioned previously, Google Lens is able to assist new market entries with language barrier problems, which usually leads to problems in localising content marketing of their brands. From the stats record, 50% of 600 corporations face threats in their international business expansion or deals with international clients due to this common mistake of having language deficiency being a deficiency. So, with Google Lens, these brands don’t have to hire and train employees with foreign language proficiency, while enabling foreign customers to get to know a foreign brand better. Not only so, it enables marketers to translate any language of the content marketing of a foreign company with similar goals. Thus, this can lead them to generate partnership marketing or joint venturing with those companies which share common goals and interests. From here, it is clearly seen that Goole Lens not only benefits the companies, but also saves companies from losing business whenever these companies are facing with bad ROI records. Furthermore, through this new mobile marketing technology incentive provided by Google Lens image search, it helps marketers to rethink and reshape their ways of conducting business, and even leads marketers who once believe in traditional marketing, to get a taste of digital marketing through the power of Google Lens to shape businesses, society and technology shifting. The more people are revealed to this new tech, the more Google Lens can release the prospective of future market entries, which subsequently adds latent value to strengthen brand identity as well as brand experiences. The only drawback any marketers or consumers face is the lack of knowledge on Google Lens, because Google Lens is the only way to bridge the gap of offline to online marketing transition, other than QR code marketing, because although QR code has been a recognised solution in certain part of the world like Japan and China, but it is not a widely recognised platform. With Google Lens as the new leader in the name of technology, Google Lens is an even better option than QR code marketing because Google Lens can scan more than just QR codes. 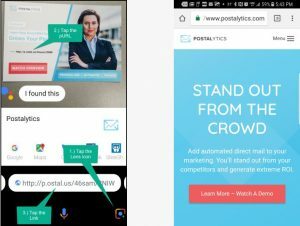 Also, whenever you enter i Not just that, QR code needs time for marketers to come up with their own unique design, while Google Lens only need to be downloaded from Google Play and activated, and there you go! 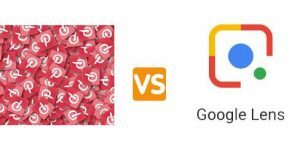 As Pinterest also works by scanning images and directing users to related images, such as home decor, food, fashion and many more, Google Lens was being accused of scooping ideas from Pinterest, just like how Telegram app copies WhatsApp social app features. 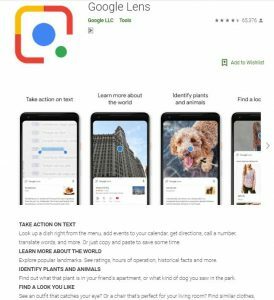 Then again, what makes Google Lens offers so much better than Pinterest is that, this app incorporates Google Assistant, being its extension app which lets users experience conducting voice search and image search simultaneously, killing two birds with one stone! Therefore marketers and consumers, if you want your world to be more productive and convenient, and to earn profits in more than your desired effects, make sure you all have Google Lens downloaded into your smartphones, because smartphones can use its powers to the brim with the presence of smart solutions like Google Lens. Side note: OnePlus 6T also have done a promotional video with Google Lens for travellers to a foreign country. If you ever get lost or for people having poor sense of direction, Google Lens is your GPS.